King Tut is nature’s finest thread. It is made from certified Egyptian-grown, extra-long staple cotton. 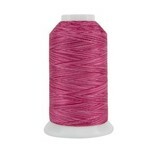 King Tut thread is designed for quilting on both home sewing machines and long arm quilting machines. 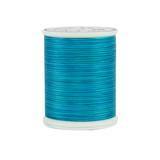 It is also a great thread to choose for hand quilting! With the finest spinning, twisting, dyeing, and finishing techniques, King Tut thread has extremely low lint, this allows for more time quilting and less time cleaning your machine. Available in 136 variegated (precision-dyed with one inch color changes) and solid colors.